Whistler elopements are one of my favourite things to photograph. With few distractions, the couple can really focus on each other and what the day means to them. I've photographed elopements in the Peak to Peak Gondola, at the Inukshuk outside the Whistler Roundhouse, in a tiny cabin along the Valley Trail, at the Stone Circle on Alta Lake, in hotel rooms, in backyards and on docks. I've also taken a helicopter to mountain tops and alpine lakes for couples to exchange their vows. Now those are probably my absolute favourite to do! You really can't beat a scenic flight up into the mountains. It certainly makes for a memorable adventure any couple would be excited to tell their family and friends about. This particular couple travelled from South Africa to say their "I Do's" lakeside under a canopy of trees. Even though an elopement may not be considered "traditional", these two still wanted to get ready separately and see each other for the first time at the ceremony. The bride was staying in a condo in Whistler Village, somewhere I had never shot before. 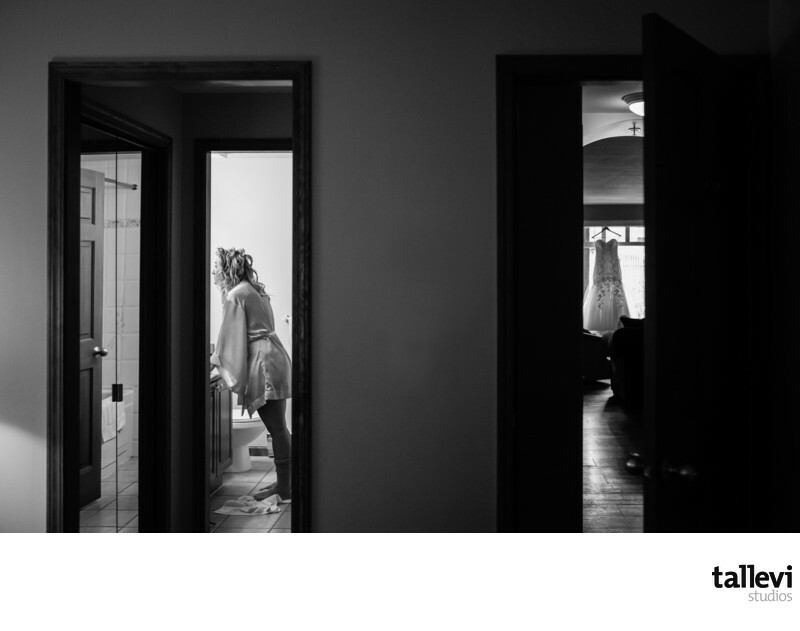 When I saw this moment come together - her getting ready in the bathroom and her dress hanging up in the window, I knew it was going to be an epic photo. This isn't a shot I've ever been able to capture before. If only all rooms had this layout! Keywords: elopement (120), Whistler (942).